We recently came across a new content site with an interesting business model and an equally interesting name! We chatted with Nathaniel Fried and Hassan Ahmed, the cofounders of Fupping, to hear a little more about why they decided to create a new content site that gives the power back to readers and how they're growing their brand! Hassan: Fupping is an innovative new platform which allows authors to take home the revenue their articles generate over their lifetime. For readers, whatever they love to read, we guarantee someone wants to write about it. Each author on our website has a unique profile that can easily be found. Nathaniel: Fupping is whatever the readers decide to make it, it’s a content platform completely orientated towards the readers. When did you launch Fupping? What was your inspiration behind the company? 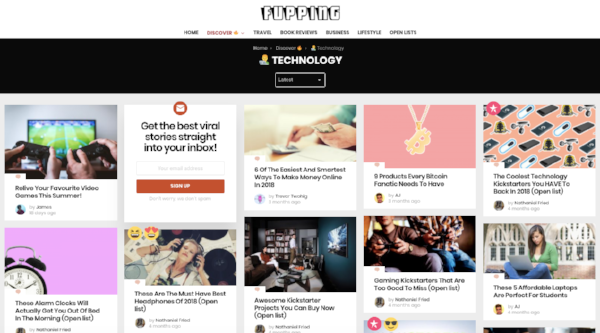 Hassan: Fupping was launched on Christmas Eve 2017 and our inspiration behind the company was user-created content that would earn the user a little cash on the side. Moreover, the idea behind user-created content was so readers could find exactly what they were looking for. Or if not, they could just write it out so others could reap the benefits in the future. Nathaniel: We want to put the power back with the readers. For too long, online media been about appealing to the lowest common denominator, we don’t think it should be like that. If you want to read about something niche, then you want it to have been written by an expert, not some under paid SEO writer. That's a really unique name! How did you come up with it? Hassan: Well it’s kind of a funny story. We were sitting in a service station having hot chocolates (as you do), trying to come up with names for our idea. Nathaniel came up with an idea of creating a word blend and he came up with smashing ‘fun’ and ‘shopping’ together to come up with Fupping. We loved how it sounded a little risqué as well as catchy. We both felt that it would stick in people’s minds the first time they heard it. Nathaniel: What Hassan said is 100% true and it’s not anything dodgy. Tell me about your logo. How did you create it? Hassan: My Partner, Nathaniel Fried, created the Logo using Photoshop. We both agreed that we loved the bold look and thought it was eye-catching and modern. Nathaniel: We made a couple of logos around simple graphics, but nothing seemed to look as nice as text. Clear, concise and to the point. How do you attract writers and readers to your site? Hassan: We attract writers mainly through social media, referrals and advertisements for writers on content writing sites and through HARO. The readers are attracted through social media, referrals and through search engines. Nathaniel: If we told you our secret marketing techniques we would probably have to kill you. What were you doing before Fupping? Is this a full-time role? Hassan: Before Fupping, Nathaniel and I were both full-time students. And this is a part-time role for both Nat and I, as we both juggle University while running Fupping. However, that does not mean Fupping is neglected, we strive to achieve objectives in the given time periods and we both devote most of our spare time to Fupping. Nathaniel: I’ve worked in a variety of media roles, from writing for the Huffington Post to running my own new site and consumer buying guide. I currently study at King’s College London, and due to my slightly OCD mentality, I can tell you exactly how my time is divided up... Studying: 33 hours a week and Fupping: 17.5 hours a week. What has been the hardest part about launching Fupping? Hassan: I personally feel like the hardest part of launching Fupping is trying not to get side tracked and stick to the objectives and idea we first started off with. As Fupping keeps growing, more and more opportunities are arising and I feel as though it would be very easy to lose sight of the idea that we originally had in mind for Fupping. Nathaniel: The hardest part has been saying no. We constantly get businesses aggressively trying to get features on our website, and sometimes you just have to say no. What are some things you've learned since launching Fupping? Hassan: I have personally learned how to better communicate with people and getting my point across in a more concise manner. Furthermore, I have enhanced my organizational skills by learning how to structure my time to work on both Fupping and University work. Nathaniel: How badly Adsense pays if your site isn’t niche.